Where do MYTHS come from? By: Rebekah Smith Karson Stone Ethan Wier. 2 Greek Mythology People have wondered about how they came to be and the world around them. So, to explain the things they didn’t understand, they started telling stories. Eventually these stories started evolving by people adding to them and they grew into myths. Most myths were created based on the creation of the world and the origins of the gods, folktales, as well as elaborate genealogies. 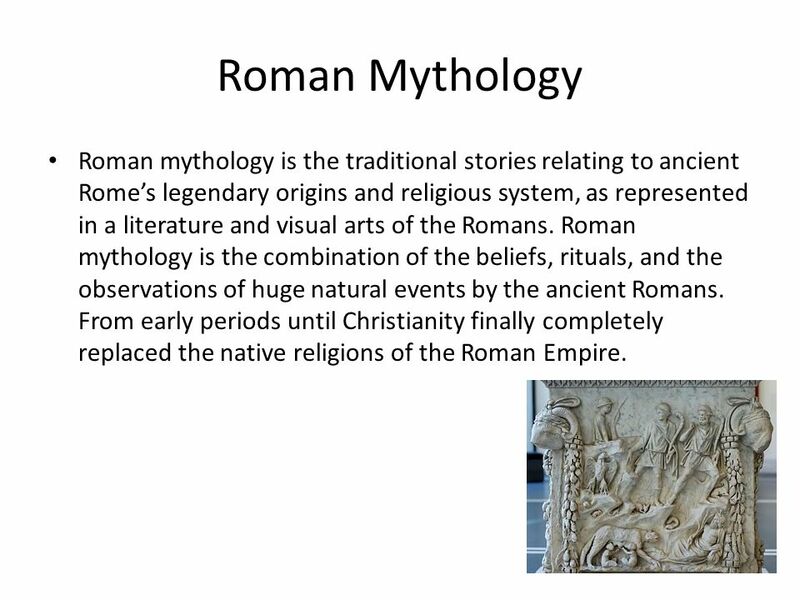 3 Roman Mythology Roman mythology is the traditional stories relating to ancient Rome’s legendary origins and religious system, as represented in a literature and visual arts of the Romans. Roman mythology is the combination of the beliefs, rituals, and the observations of huge natural events by the ancient Romans. From early periods until Christianity finally completely replaced the native religions of the Roman Empire. 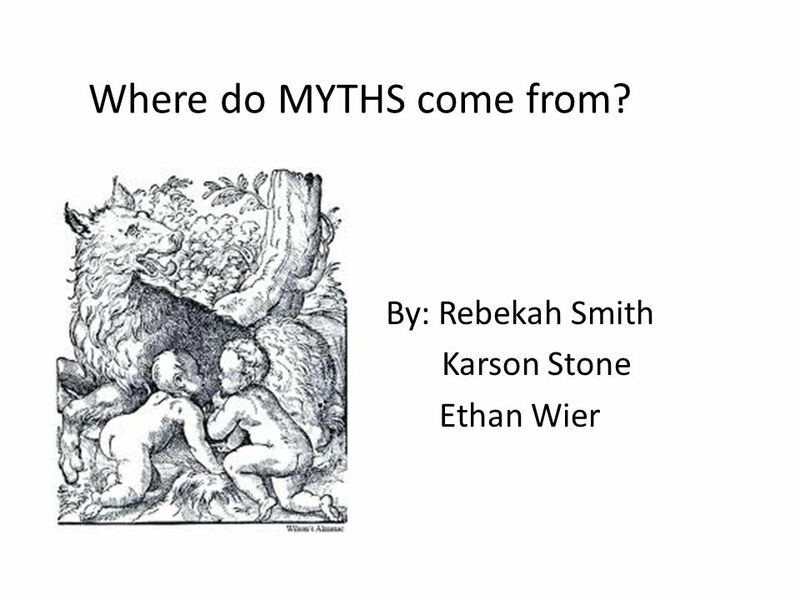 Download ppt "Where do MYTHS come from? By: Rebekah Smith Karson Stone Ethan Wier." Folktales Tall Tale Legend Myth Fable. Traditional Literature- Fable The characters are usually animals that have human qualities. One animal usually. M Y T H O L G English 9B Mrs. Lux. Ancient Cave Paintings Ancient people were nomadic and went wherever they could find food, water and shelter. Many scholars now think that ancient man. GREEK MYTHOLOGY I can explain how the Greeks used myths to explain their beliefs about the world and who the Greek gods and goddess were. 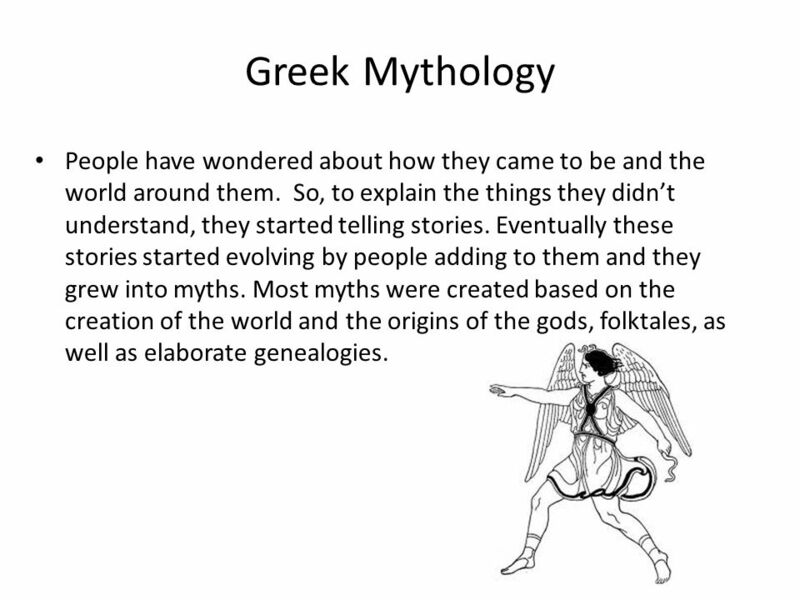 Greek Mythology Introduction. What is a myth? A myth is a story that ancient cultures used to explain the mysteries of the world. Examples: - How the. What does the word “mythology” mean to you? Name some of the major mythologies that you know and tell a little about the mythology. Biblical Literature 1.What does it mean to read the Bible “as literature”? 2.What is the Bible about? 3. How are we going to study the Bible? Native American Oral Tradition “The Four Elements” On the final, you will be asked to read a Native American tale and analyze it via MC questions for the. EARLY AMERICAN LITERATURE Creation Myths. HOW WAS THE WORLD CREATED?  Consider and write what you might know regarding different accounts of creation. Ancient Greek Mythology What do I need to know? How does Ancient Greek mythology provide insight into the customs and values of the period? –What is. Main points from pages Mythology tells us how ancient people thought and felt about the world around them. When the myths were developed, people. Native American.  Religious principles are hard to explain because most are passed down verbally from generation to generation and tribe to tribe. Not. Elements of Myths 11 CP Notes Mrs. Bukowski. What are myths? Fictional tales that explain / express: 1. The actions of gods and heroes 2. Questions in. Mythology. Definition 1.A body of myths, as that of a particular people or that relating to a particular person 2.A set of stories, traditions, or beliefs.